TALLAHASSEE, Fla. – There have been dramatic wins, heartbreaking losses and, somewhere along the way, a bye week disrupted by a hurricane. The Florida State football team has seen a little bit of everything over the first half of its season. Despite an uneven start to the campaign that saw FSU take a 3-3 record into last week’s open date, the Seminoles are more than ready to embark on the home stretch. That begins Saturday, when they host Wake Forest (3:30 p.m.) in a homecoming date at Doak Campbell Stadium. He’s not kidding about the opportunity. Florida State’s second-half schedule features four games against Top-15 opponents: No. 3 Clemson, at No. 15 North Carolina State and at No. 4 Notre Dame in consecutive weeks, then a home date with No. 12 Florida to end the regular season. Beyond those, the Seminoles will tangle with Wake Forest’s electric receiver Greg Dortch and Boston College running back A.J. Dillon, the reigning ACC offensive rookie of the year. Per the NCAA, it’s the toughest remaining schedule in the country, with those six opponents holding a combined .842 winning percentage. But it’s also one that also provides Florida State with plenty of chances to earn some headline-grabbing victories and change the perception of their first season under coach Willie Taggart. Before the Seminoles can entertain any notions of top-five upsets, they first must contend with Wake Forest. And while no college football fan would mistake the Demon Deacons with the likes of Clemson or Notre Dame – they’ve lost three of their last four games, with those losses coming by an average of more than 35 points – the Seminoles would still be wise to give Wake their full attention. 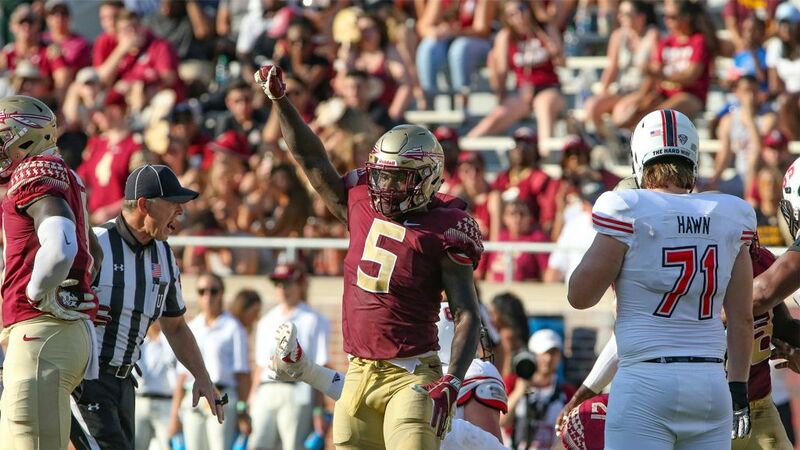 That’s especially true for FSU’s defenders, who will line up across from a Wake offense that is solid in both the running and passing games, while boasting a do-everything receiver – Dortch – who averages the second-most all-purpose yards in the country. On the other side, Wake will give FSU’s offense one last chance at a tune-up before facing some of college football’s best defenses. The Demon Deacons rank near the bottom of the nation in nearly every major defensive category, while upcoming opponents Clemson, NC State, Notre Dame and Florida all have defenses that rank 35th or better in total defense. Clemson is third. Which is why the Seminoles can’t afford to look ahead to anyone else coming their way. Fagan is right. There are still goals left for FSU to achieve: Beat Clemson and the Seminoles will reassert themselves in the ACC. Beat Florida, and they’ll reassert themselves in their home state. Win three of the next six games, and the nation’s longest active bowl streak will extend another year. And why dream small? Reel off six straight wins and a sixth “New Year’s Six” bowl appearance in seven years might be on the table. OK, maybe hold off on that last one until at least after the Clemson game. But it’s not impossible. Still, the Seminoles know the reality of their situation: Which is that if they want any of those goals to come to fruition, and for any of those games against ranked opponents to matter, they first must properly deal with what’s in front of them. ‘We’ve got some good people in this world’: Taggart got a firsthand look at the horrors of Hurricane Michael when he learned that one of his players, sophomore defensive end Janarius Robinson, lost his family home in the storm’s path of destruction. But Taggart also saw a glimmer of hope in the way that the Florida State community rallied around both Robinson, a native of Panama City, Fla., and the rest of the Florida panhandle. FSU fans and thousands of generous others this week contributed to an NCAA-approved Gofundme campaign for Robinson’s family, as well as two FSU-sponsored funds aimed at providing broader relief from the storm. Taggart, Noles to make Pow Wow appearance: Comedian Nick Kroll might be the headliner at this year’s “Pow Wow,” but fans and students in attendance will get to hear from Taggart and a handful of players when they stop by the annual homecoming pep rally. The event, hosted by Gene Deckerhoff, takes place Friday night at the Donald L. Tucker Center. Florida State on Saturday will welcome back the first four African-American players in program as part of its “Sod Talk” series at the Sod Cemetery. That includes cornerback J.T. Thomas, who broke the color barrier at FSU in 1970 and went on to win four Super Bowls with the Pittsburgh Steelers. Florida State is 57-12-1 all-time on homecoming, which includes a 3-0 mark against Wake Forest. FSU owns a 29-6-1 record against Wake Forest and has won six straight in the series. FSU has held its opponent under 30 points in 10 straight games. That’s the fourth-longest active streak in the country.